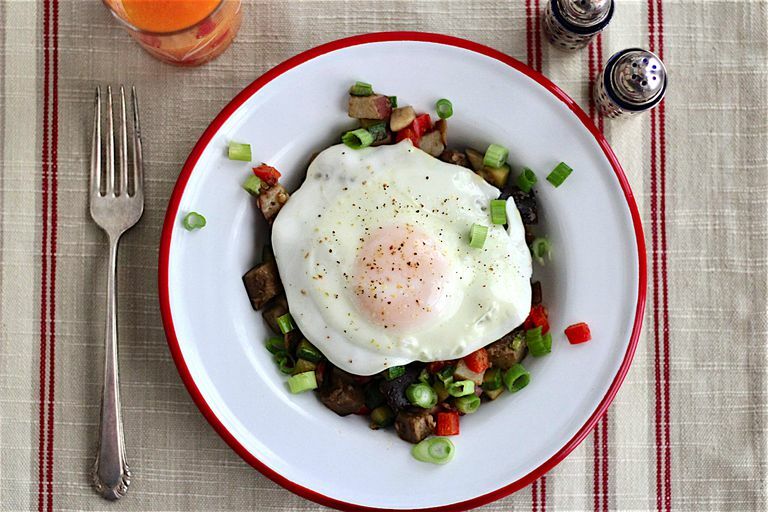 This vegetarian dish makes a nice weekend breakfast or brunch offering and is hearty enough to work as a quick weeknight “breakfast-for-dinner.” This tasty hash, minus the eggs, also makes a great vegetable side dish for a main meal. All of the ingredients are low in FODMAPs, so you can enjoy without triggering IBS symptoms. In a large skillet, heat 2 teaspoons of garlic-infused oil on the medium high heat. Add potatoes, spread evenly in the pan, and let sit undisturbed until golden brown on the bottom, 1½ to 2 minutes. Loosen the potatoes with a spatula and turn pieces over. Sautee, stirring occasionally, for 1 minute more. Add 2 teaspoons garlic infused oil, eggplant, bell peppers, salt, and pepper. Cook the vegetables, stirring and turning pieces over until eggplant and pepper softens and turn brown in spots, about 5 minutes. Add zucchini and oregano and cook until zucchini is crisp but tender 3 to 4 minutes. Add ¼ cup of water and stir until liquid is evaporated and potatoes are cooked through about 1 minute. If the potatoes are not done, add 2 tablespoons of water, cover, reduce heat to low, and steam the vegetables for up to 8 minutes. Remove from heat and stir in the scallions. Cover to keep warm. Heat a small frying pan over medium-high heat. Add 1 teaspoon of garlic-infused oil. Crack eggs into skillet and season lightly with salt and pepper. Cook until eggs are cooked through, either "sunny side up" or "over easy." To serve, place 1 ¼ cups of hash on a plate and top with one fried egg. Replace scallions with ¼ cup minced chives. Use diced yellow summer squash instead of zucchini. Omit red bell peppers and substitute jarred, diced roasted bell pepper added in the last minute of cooking. For spicy heat add ½ teaspoon crushed red pepper flakes or several pinches cayenne pepper. Sprinkle dish with some grated Parmesan cheese before serving for a richer flavor. We recommend cooking eggs all the way through to avoid the risk of food-borne illness. If you like your eggs sunny side up, add a tablespoon of water to the skillet when the eggs are almost done, cover the pan, reduce heat, and allow the steam to cook the tops of the eggs.